Large Bear Enclosures - Bears in Mind - For whom? 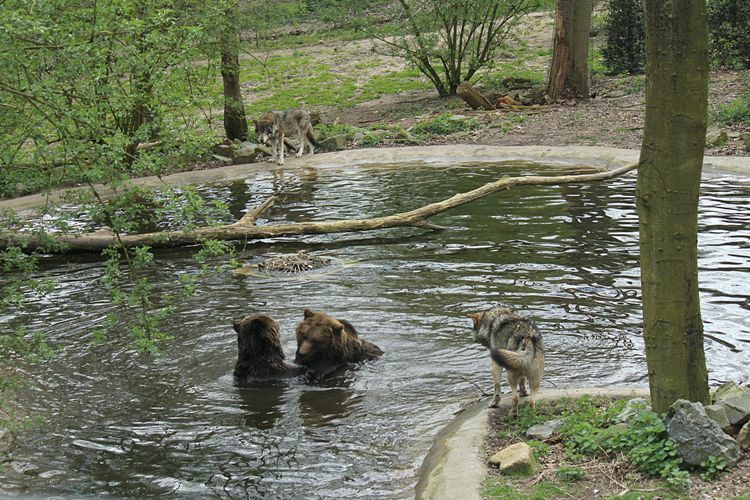 With the information presented on this website any organisation, government or NGO working with bears will get ideas and information on how a Large Bear Enclosure for European brown bears (Ursus arctos arctos) is built, managed and maintained. When a LBE has the role of a sanctuary for abused bears, it should preferably be established in the country where the bears originate from. Take for example the sanctuary in Turkey where more than 50 former dancing bears are now finding a home in a large 6 ha multiple enclosure LBE. Local people will get the opportunity to learn about bears and become aware of the problems in their country concerning badly-kept, abused, mistreated or even nuisance bears (provided that the right education and information tools are used). The problems need to be solved at the roots. The information presented on this website is based on experience with European brown bears. However, it can also give ideas on how LBEs for American black bear (Ursus americanus), Asiatic black bear (Ursus thibetanus), Sloth bear (Melursus ursinus), Sun bear (Helarctos malayanus) and Spectacled bear (Tremarctos oronatus) might look like. Each bear species has different requirements. Modifications in design, the habitat and materials used are necessary. For example; enclosures for bears that originate from tropical regions need to be equipped with well insulated, frost free conditions when built in colder parts of the world. Species like Sun- and Sloth bear also need special requirements in their in- and outdoor enclosures, for they are species with a habit of digging and may destroy their surroundings. For larger (sub)species such as Grizzly bears (Ursus arctos horribilis), Kodiak bears (U. a. middendorffi), Kamchatka brown bears (U. a. beringianus) or Polar bears (U. maritimus), it is advisable to use building materials that are much stronger/tougher and can withstand much more impact.